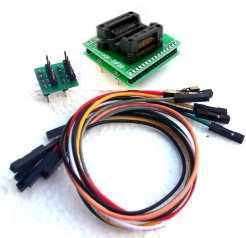 This adapter set has flexibility for any 10mm chip pin out SOIC to DIP conversion. It can be used on special SOIC16 pin out. Such as AT25DF641 etc. It also can be used on reversed pinout SOIC chip for remapping to a non-reversed pinout DIP pinout. 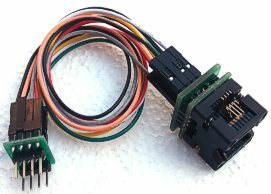 It comes with a ADP-028, ADP-067 and connection 16 jumper wires needed.